Well, I’ve been busy, as you might imagine, and I think I’m *finally* through with an important piece of marketing for my copywriting services. I’m going to email the instructor and get an opinion tonight or tomorrow. Tomatoes are starting to show up in the HeatCageKitchen garden! 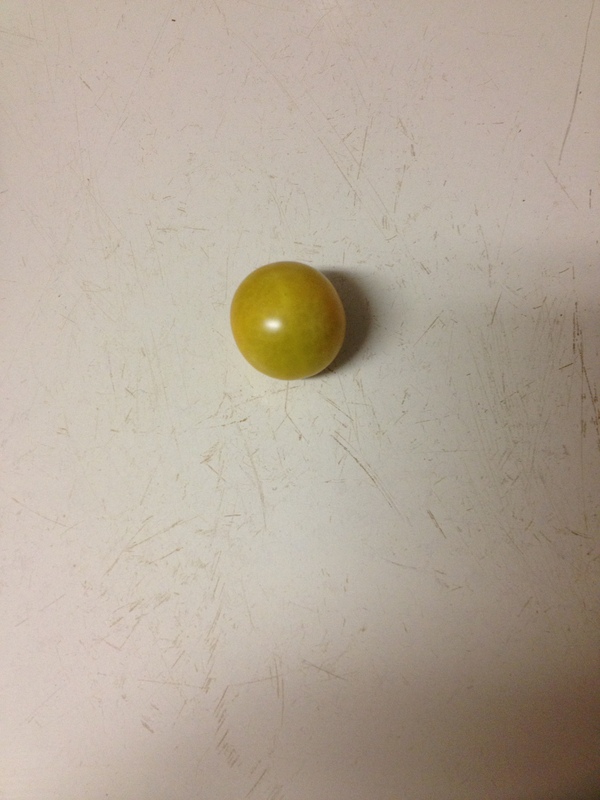 My first organic yellow tomato. Woo hoo! I’ve picked two more, and will probably get a couple more yellows tomorrow and possibly my first red. The Chocolate Cherry plant has some green ones, but no ripe ones yet. (That could be a whole blog post by itself.) The GER tells me to get my zucchini recipes ready, and I put my hands on three just this morning. He’s got a couple of whoppers growing in his garden, and if there are enough, I’ll be taking them off his hands. Just hope I can return the favor with. . .something. And after an inconsiderate animal (probably a possum) dug up not one, but two of my Romaine lettuce re-growths, I asked Neighbor K for the stub off her lettuce when she was coming back from Kroger one evening. She did, and it’s growing nicely. I’ll get more lettuce soon, and have asked K for any subsequent lettuce stubs. They grow fast, and the celery is growing nicely too. More on the garden soon. A couple of weeks ago I went back to Woodlands Wellness & Cosmetic Center for my six-month follow-up and a couple of blood tests. I got to see the wonderful Dr. Sakina Davis and told her about the things I’ve been doing to try to sleep. . .I think I’ve got it down. Maybe I’ll talk about that in an upcoming post. But when I head to The Woodlands, there are two stops I just have to make: Trader Joe’s and Frost Bake Shoppe. It was afternoon, and I got THE last gluten-free cupcake in the shop. Boy was I glad, too. 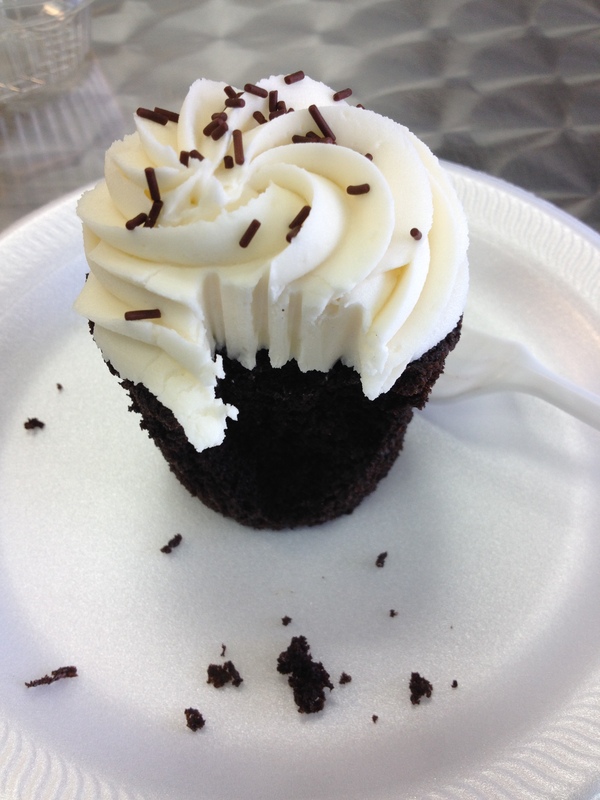 Gluten-free Chocolate cupcake with Vanilla icing. Perfection. 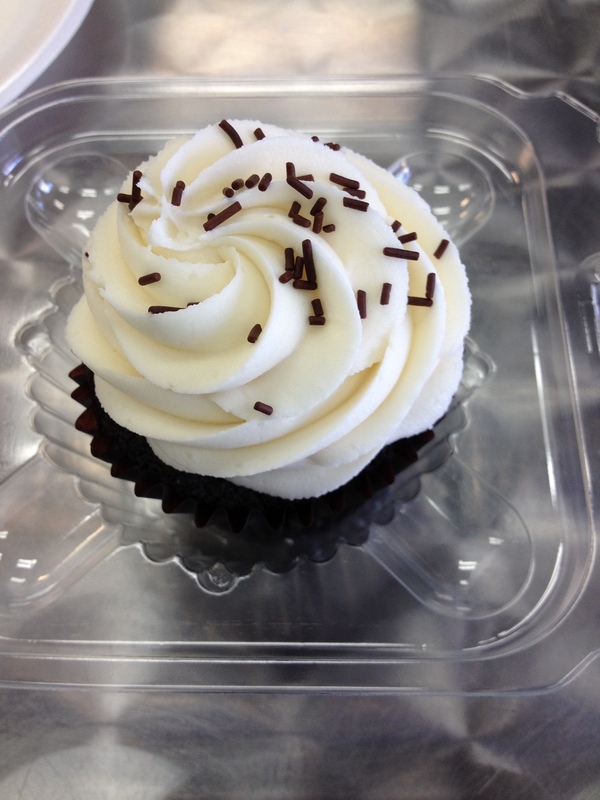 And, as always, tastes even better than it looks, just like a gourmet cupcake should. Yum. . .come to Mama. . . . I didn’t bring back a bunch this time, because, quite frankly, it’s too hot right now (and that would have been a bit expensive this time around.) Maybe one day soon I’ll be able to go back and I’ll remember to bring an ice chest to bring them back. And I don’t think I’ll be going back until the fall, so my insulin levels are safe. 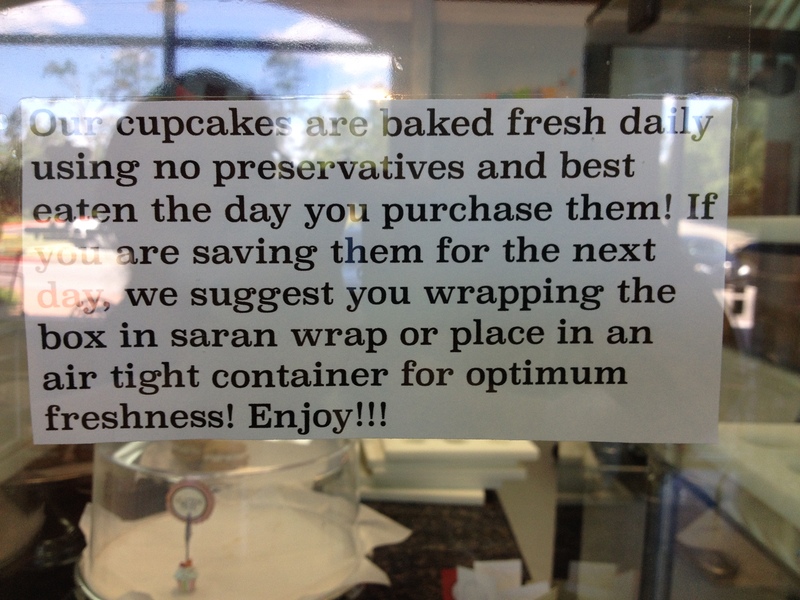 The new “warning” that comes with the Frost cupcakes. Now that it’s warming up, you might be thinking about iced coffee. If you are out and about and in the vicinity of a Dunkin’ Donuts, might I suggest you try their iced coffee. Last weekend, I visited one of my writer friends, and we stopped off there after lunch. Both of us really enjoyed the iced variety, and I’ll tell you more with the restaurant review, in an upcoming blog post. But I have to share this quick product review. I just got this product a little while ago. I was on Casabella’s website the other day, ordering replacement brushes for my 12-yo carpet sweeper; the GER insisted I get one while I was living in his beastly house because of all the thread and sewing debris on the carpet. Well, it’s about time for a new brush. And then I found something else. Dear Readers, do you like eggs but don’t like messing around to cook them? Do you believe you “can’t cook,” but excel at microwave dinners? 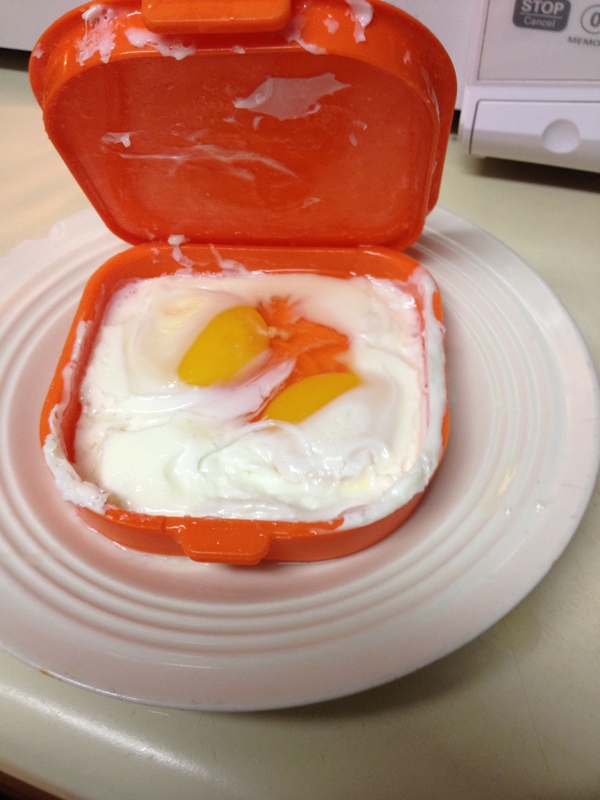 Do you like egg sandwiches–with cheese? Well, I have a tool for you. 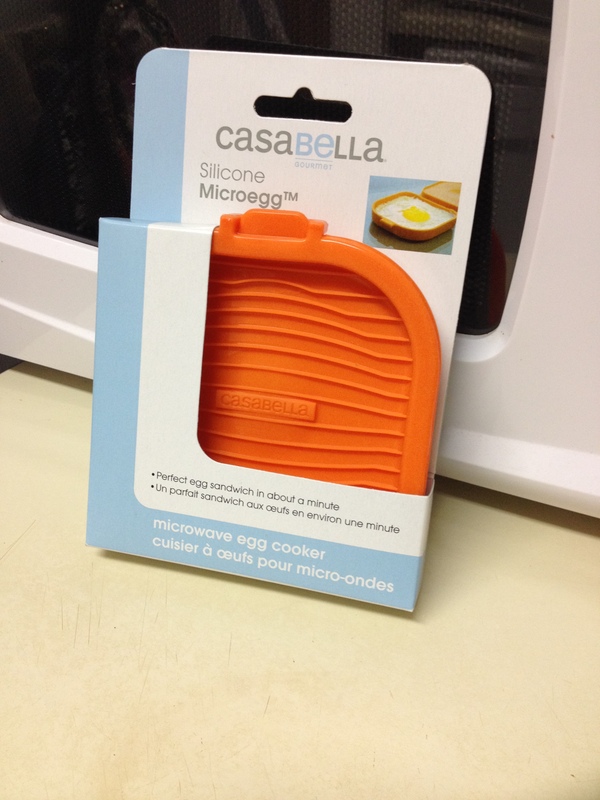 Casabella’s Microegg is cute, neat, and can microwave one or two eggs for you quickly. Why is this better? Because–it’s SQUARE. 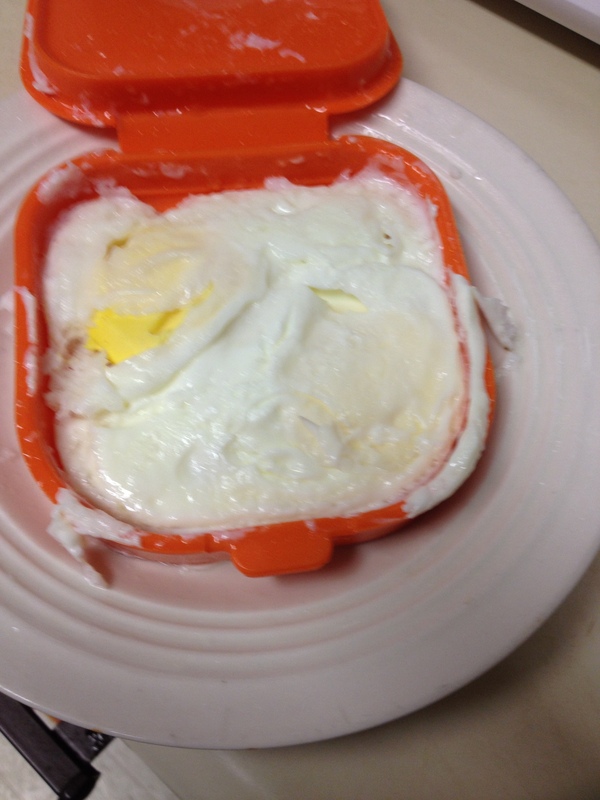 And by cooking the egg square, it will fit better on a sandwich. Are you seeing the logic? Two eggs, ready to roll. Well, OK, over-cooked a bit, but this was operator error–NOT the fault of the tool. Although Casabella has an easy return process, I will NOT be returning this baby. Ever. I’ll just cook the eggs for a shorter period of time, that’s all. 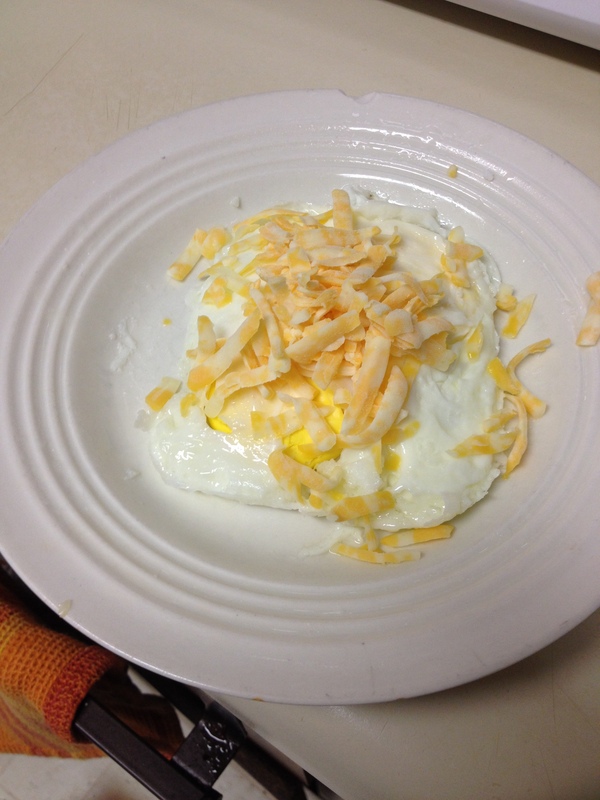 Cheese and egg. . .yum. For a quick breakfast, lunch, dinner, or “I just got home and I’m starving” meal, this is a pretty good thing to have around. It just couldn’t be simpler, you know? Add some iced coffee and you’re good to go. 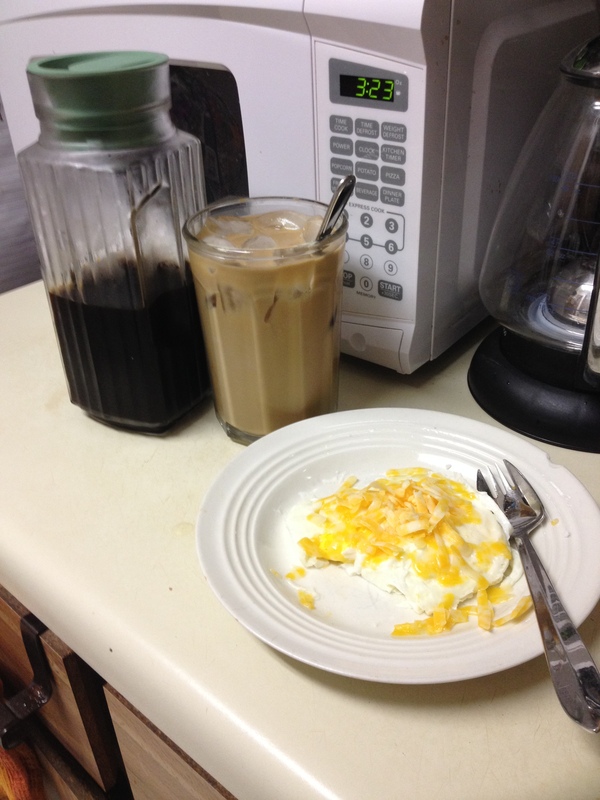 See that little bottle to the left of my glass of iced coffee? Um. . .when I made my last batch of iced coffee, I might have accidentally put it into the 19-year-old pitcher I got as a wedding present. . .and then I heard a loud CRACK, and saw coffee seeping onto the stove. And I had a mess to clean and a pitcher to toss out. I went to Target later and bought that one and a bigger one. So the lesson there is to put the hot coffee into a BIG mixing bowl and let it COOL before putting it into a refrigerator vessel. And it helps that both Anchor Hocking pitchers have “NO HOT LIQUIDS” etched on the bottom. 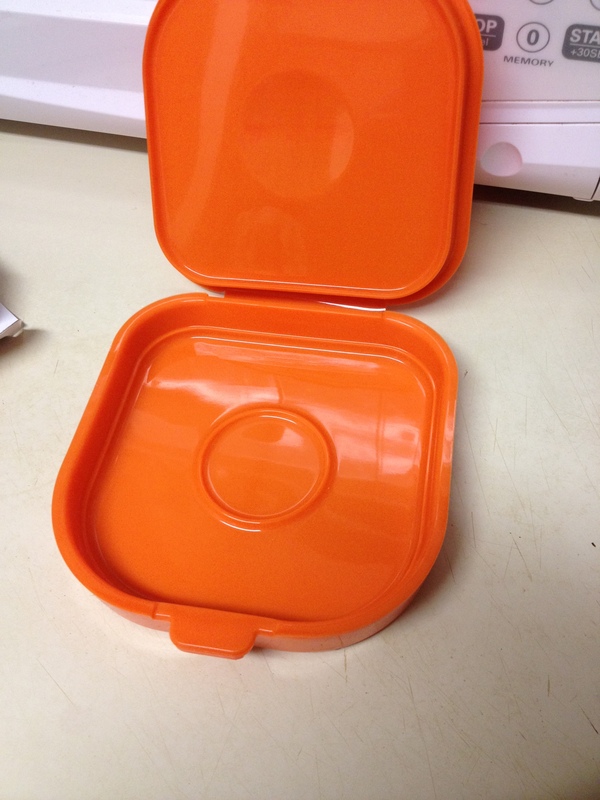 At least they have lids. This one is currently listed on eBay for $149. No, I am not bidding on it. It’s not even on my watch list. There are other listings for a lot less, but this one apparently has never been used, or just used once for the seller to ask that much for it. A few months ago, I did purchase a Suzy Homemaker Super Grill, with the griddle and drip pan, but it was MUCH less expensive! No box, and I copied the instructions from another listing to print. I cleaned it–very carefully–and did indeed cook a few pieces of bacon on it. I unplugged it, let it cool, cleaned it again very carefully and packed it back in the box. It works with a little heating element that heats up the little pan. Takes a while, too–but that little space on the left allows you to warm buns while the burger or hot dog is cooking. Not bad for a 50-year-old toy appliance. When I get to my country house, I’ll have the entire collection on display. And, I will use them occasionally, too. Casabella’s website has lots of neat little kitchen things like The Microegg, as well as high-quality cleaning products like the sweeper I mentioned (and the GER insisted I buy!) Bed, Bath and Beyond has a selection of Casabella’s cleaning and storage products, but almost none of their kitchen stuff. What a shame. So, Dear Readers, you have a little weekend tip (if you’re reading this on Friday.) 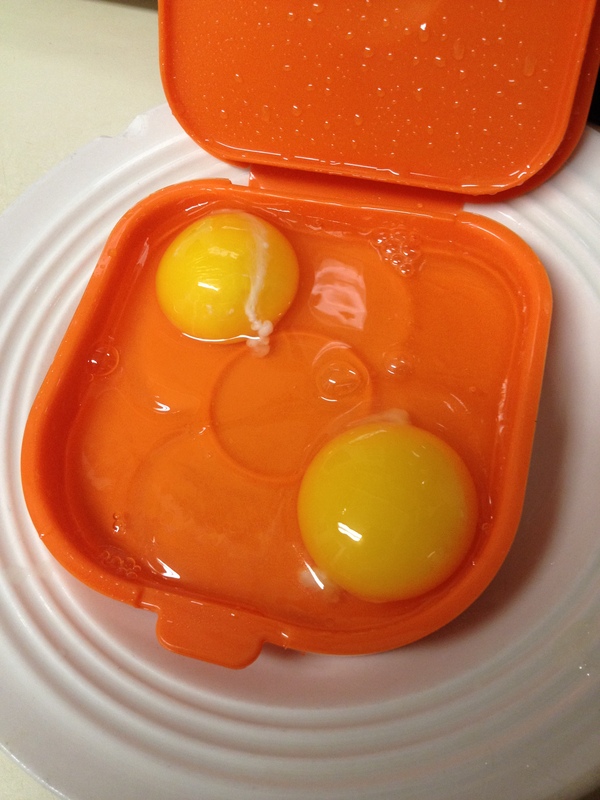 This is especially useful if you live alone, or with one other person–especially if the other person doesn’t eat eggs. Another tool to pack up in a gift box for the graduate going off to college, too. Make it a good weekend, and Happy Dining!